Preparing menu for kids is a challenging task for all mothers as the dish should include all sorts of nutrients to make them healthy and strong. Among all nuts, including Walnut into my kiddo's meal is a big task for me as he does not like to eat as such because of the mild bitter and nutty taste. But considering all health benefits of Walnuts, I love to include it in my cooking in a way my son loves it and also in addition, it gives a richness to the dish. 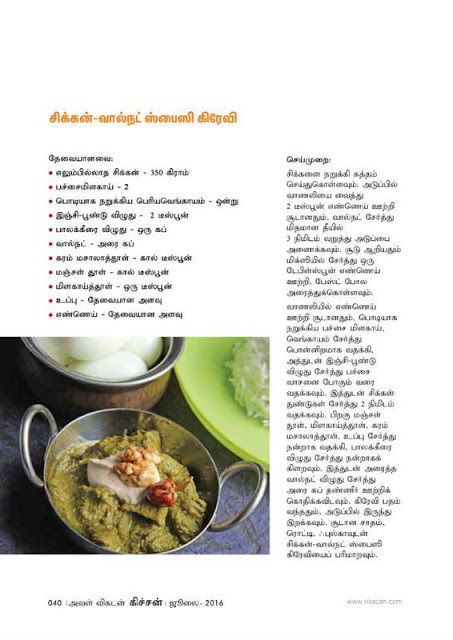 Today's recipe is so special and close to my heart as it got published in a popular Tamil magazine Aval Kitchen ( 2nd Anniversary Special ) in July 2016. Along with this recipe, 5 more interesting and innovative recipes also got published which I will be posting on my page soon .... Stay tuned ! Chicken and Walnut in Spinach gravy is a creamy and delicious curry which goes well with any Indian breads, Rice and pulao. Walnuts are roasted and made into paste which in turns gives a creamy texture to the gravy. Along with Walnuts, I have also included Spinach in this recipe to make it even more healthy. Heat 2 Tsp Oil in a pan and add walnuts. Fry it in a medium flame for 3 - 4 minutes ( do not burn the walnuts ). Once done, remove from the flame, cool and grind into fine paste by adding 1 tbsp oil. Add little water and grind it further to make a smooth paste. Keep aside. Heat 1 tbsp oil in a pan and add green chillies followed by chopped onion and ginger garlic paste. Saute till it turns translucent and the raw smell of ginger garlic smell goes off. Add the chicken pieces and saute for a minute. Now add turmeric powder followed by red chilli powder, garam masala and the required amount of salt. Mix well and add the spinach leaves puree. Allow it to cook for couple of minutes and add the walnut paste along with 1/2 cup of water. Cook till the chicken gets cooked and the oil separates from the gravy. Serve hot with Plain rice or Indian breads like Roti, Naan, Phulka etc..